We are one of the paramount cast steel rolls manufacturers and carbon steel rolls suppliers, based in india. These alloy cast steel rolls and carbon steel rolls are worldwide well-known for their unmatched quality. You can browse wide range of alloy cast steel rolls and carbon steel rolls at apex rolls. 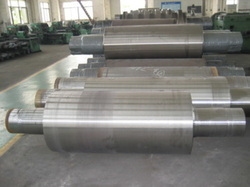 These rolls are hypo-eutectoid steel rolls alloyed with Chromium and Molybdenum. The heat treatment of these rolls involves normal double annealing followed by tempering cycle which improves toughness and thermal shock resistance. The microstructure is primarily pearlitic with broken cementite. These types of Rolls offer mechanical strength of higher degree with good weldability. Adamite Steel Rolls are mainly composed of fine pearlitic matrix with some cementite in the structure. The structure consists of well broken up and dispersed carbides in a pearlitic matrix complementing the hardness and wear resistance imparted by highly alloyed matrix. CHICGS is instrumental in offering premium quality Steel Rolls- Alloy to our prestigious customers. Precisely engineered in accordance with the industry laid standards, these rolls are ideal for rolling heavy and medium metal sections. To ensure high standards of quality, these steel rolls are manufactured using sophisticated plant machinery. ADAMITE ROLL are composed mainly of pearlite with some cementite in the structure. Adamite rolls are strongers than cast iron rolls and harder than other steel rolls. An outstanding feature of adamite rolls in that the in hardness is about the same as that of the surface. 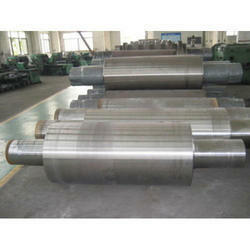 Adamite steel rolls are classified asordinary, alloy, special, composite, or high alloy compound. We offer high quality product backup rolls of alloyed forged steel (3% CR).